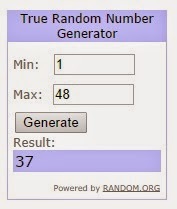 The cutting assignment winner who gets a My Sunshine Charm Pack from Discover Fabrics is . . .
Now that we have your fun units made, it is time to trim then down and turn them into a block. Playing with angels can be so much fun, just try not to overthink it. Relax and have fun. So let's get to the first part of today. So, take any size square ruler that is larger than 5 1/2". The 6" and 6 1/2" ones will probably be the easiest to use (unless you have a 5 1/2" square ruler, shown later). Lay your ruler on your Improvisational unit. You will be checking 3 places for alignment before you cut. First ensure that the bottom left end 5 1/2" marks (white arrow) are on your print rectangle. Second, ensure that the 5 1/2" mark on the side and top of your ruler (black arrows) are still on the background fabric. When those three places are aligned, go ahead and cut along the rulers edge on the left and top of your unit. Now spin your unit 180 degrees. Align the 5 1/2" marks on your left hand side and bottom of your ruler with the newly trimmed edges of your block. And trim the remaining 2 sides of your unit. 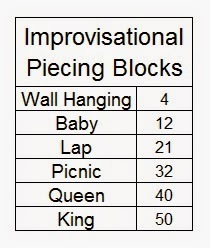 Now you have a wonky Improvisational quarter block. Just keep trimming each unit to 5 1/2" x 5 1/2" square. And if you do happen to have a 5 1/2" square ruler, all you have to do is place the ruler on your unit, ensure that 2 ends are on the print rectangle and the other 2 ends are on background fabric, and then trim around all 4 sides. And like above, remember to angle up, and angle down. Once you have all your pairs stitched, clip your threads and move to your ironing board one last time ;) Once again, I like to press this seam open as it helps to make that center where all the seams are coming together lie flat ;) Now press, press, press. And with your Assignment all complete, you are ready to link up for a chance to win the Weekly Prize!!!! This weeks Weekly Prize is being sponsored by Shabby Fabrics and a huge thanks goes to them for their support of the Irish Chain Twist Quilt-A-Long. This weeks prize is an Autumn Lily 6 Fat Quarter Pack and an Autumn Lily Mini Charm Pack!!! And Don't forget to add your sewn units to the Happy Quilting Quilt-A-Long Flickr group and to post it on social media with using #irishchaintwistqal. I am so excited to see your blocks!!!! So let's get to some trimmin and stitchin!!! And if you have questions, don't hesitate to email me at happyquiltingmelissa@gmail.com. Have a Happy Quilting Day!! Working on this week's assignment right now! My daughter and I were wondering....what size are you making? I apologize if I missed it in one of your blog posts! LOL! Stephanie, I'm being purely selfish. I'm making me a lap quilt. I chose fabrics that I had fallen in love with. Since buying my new Janome, I've made a quilt for both my grandchildren, my youngest son and my oldest, and a few smaller gifts like bed runners and table toppers. I wanted something for me. This is my first quilt-a-long and I've been working on it in-between my oldest son's quilt. Love the experience! What are you working on?